Dell Latitude E6430 SSD 256 RAM 4GB Windows 7 Pro 64 bit. -Speedy SSD Crucial M500 256GB. - WiFi Dell ABGN Bluetooth 4 RJ45 Gigabit Ethernet. - AVG Antivirus, MBAM, Spybot, RarZilla, Roxio Creator Burner. (Latitude E6430. -Core i7 3rd generation. Number of HDMI Ports. Adobe Flash Player. Hard Drive Size- 500. HOWEVER, THIS DOESN'T AFFECT THE LAPTOP'S FUNCTIONALITY). -Windows 10 Professional. All UNITS HAVE BEEN THOROUGHLY TESTED. DELL LATITUDE E6430. HD 1600x900 resolution. storage: Hitachi 320GB HD D. All our photos have increased contrast to show imperfections as best as possible. We also check and test all ports such as USB, sound and mic, HDMI, DVD drive and everything else. WiFi is built in with an HDMI port as well! MPN E6430 Latitude Windows 10 Laptop. Model e6430. 4GB FAST DDR3 RAM 320GB SATA Hard Drive. DVD RW DVD Drive for burning & playing CDs & DVDs! HDMI out VGA Monitor out ports included! Dell Llatitude E6430 14" Laptop. All In One. Extended Warranty 1/2/3 years. We recycle. Dell Latitude E6430 - Intel Core i5-3320M - 8GB RAM 256GB SSD HDMI Laptop 14.1"
Dell Latitude E6430 - Intel Core i5-3320M - 16GB RAM 256GB SSD HDMI Laptop 14.1"
Model: Dell Latitude E6430. Recovery CD: No, recovery partition only. Networking: Integrated LAN 10/100/1000 Gigabit Ethernet. Laptop battery: 6 cell battery. No claim is made as to the suitability of the unit for any particular purpose. Model E6430. Replaced drive cover and bottom case cover, then checked hard drive to verify SMART status is good. Upgraded to 8gb RAM, a new 500gb HDD, and Windows 10 Pro from original Windows 7 Pro. Your Choice of: RAM + HDD + SSD + Windows! YOU Decide! Hard Drive: 320GB HDD. We aim to provide high-class services and should you not be 100% happy. Scilly Islands TR21-TR25 - £21.99. Scottish Islands HS1-HS9, IV41-IV49, IV51, IV55-IV56, KW15-KW17, KA27- KA28, PA20, PA41-PA49, PA60-PA78, PA42, ZE1-ZE3 - £21.99. Dell Latitude E6430 with Windows 10. Model : Latitude E6430. Dell achieved all this, yet still maintained an easy to use system with the superb build quality that you associate with Dell. You will also find the necessary docking station port and usual headphone and microphone sockets. Hard Drive Capacity: 1TB SSD Capacity: Not Applicable. This laptop has been cleaned, tested. Laptop is ready to use straight from the box. Condition - Refurbished Laptop in Good Condition. Marks & scratches throughout from general use. Open Office is installed. 215- E5430 laptop. Core i3-3130m @ 2.60Ghz 4GB RAM. 14.0” 1366x768 screen. 216- E5430 Laptop. Core i5-3210m @ 2.50Ghz 4GB RAM. 217- E5430 laptop. Core i5-3340m @ 2.70Ghz 4GB RAM. 14.0” 1600x900 screen. DELL LATITUDE E5430. Who are we?. At this point the item will be re-listed. If my laptop turns faulty and is still under warranty, can I get it repaired myself?. WEBCAM, HDMI, SD CARD SLOT, VGA. Credit / Debit Card. WHAT'S INCLUDED: - Laptop ONLY. TESTING: - The unit Powers up to BIOS fine with no errors or passwords. Fans run fine. WHAT'SNOT INCLUDED: - Hard Drive, Caddy or screws. OS is not installed. Hard Drive: 256GB. Screen Size: 14". CD Drive: Yes. WHAT'S INCLUDED: - Laptop ONLY. TESTING: - The unit Powers up to BIOS fine with no errors or passwords. Fans run fine. WHAT'SNOT INCLUDED: - Power adapter / Other accessories / Cables / Software / Drivers etc. WHAT'S INCLUDED: - Laptop ONLY. TESTING: - The unit Powers up to BIOS fine with no errors or passwords. Fans run fine. OS is not installed. WHAT'S INCLUDED: - Laptop ONLY. TESTING: - The unit Powers up to BIOS fine with no errors or passwords. Fans run fine. SPECIFICATION: - See title/images for specification. OS is not installed. MODEL NUMBER E6430. Wow, what a deal! PRODUCT LINE Latitude. MANUFACTURER Dell. OS Windows 10, Pro, 64-bit. WARRANTY 12 Months. You won't find cheaper prices anywhere! Rapid IT's highly trained staff each have their designated area of expertise, so should you need advice or assistance you know you'll be getting the best possible help. 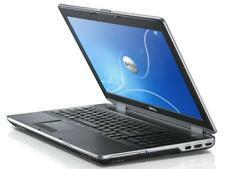 Dell Latitude E6430 14" Laptop. All In One. We recycle.